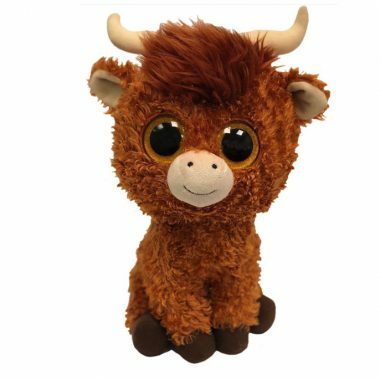 Angus is an adorable fuzzy brown Highland cow! His large button eyes are gold and sparkly and he has a cream coloured nose. He has a tuft of brown fur on top of his head and two small cream coloured horns. But seeing through them is kind of rough! Angus was first released in March 2018. His Birthday is 29th December. There are four different versions of Angus. This is the 9″ Beanie Boo Buddy version. A smaller 6″ Beanie Boo, an extra large 12″ variation and a tiny Beanie Boo key clip also exist.